Collective Architecture have been appointed by Sanctuary Group to draft plans for conversion and redevelopment of the former Victoria Infirmary, Glasgow, to provide 400 new homes. Careful consideration since the site acquisition in August it has been decided that the Nightingale wings along Battlefield Road and the gatehouse off Langside Road can be retained in addition to a listed administration building – allaying fears that much of the landmark hospital would be lost. Nick Walker, of Collective Architecture, said: “The Victoria Infirmary redevelopment represents a wonderful opportunity to deliver new homes in Langside within existing and new buildings. A community engagement programme will get underway at the end of January to gauge local opinion with demolition already underway on-site. Collective Architecture are delivering 206 homes on behalf of Sanctuary in Anderston. I'm glad this has fallen to Collective, looking forward to seeing what they come up with. Very encouraged by the appointment of Collective Architecture, who have shown great ability on conservation projects in the past - such at the Titan Crane in Clydebank. 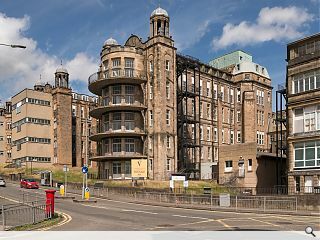 Also great to hear that explicit reference has been made to the preservation of the Campbell, Douglas & Sellars' Ward Blocks - which shamefully for HES are unlisted - but it raises doubt over whether or not Watson, Salmond & Gray's 1931 Paying Patients' Annexe that faces Battlefield Rest will be retained too? Surely it must also be viable for conversion to residential use. Great news! Also happy they are going to keep more of the original buildings. I mean pull down the modern mid 20th century extensions and all but keep the Victorian era buildings! Having been very encouraged by this announcement, as a long term resident of the Southside I was deeply dismayed to discover today that the perfectly sound and readily convertible handsome red sandstone Victorian villa which faced up Langside Road at the north end of the site, and was the mangers house, was bulldozed last week! What a waste and way to go Sanctuary! Nice ploy to have your bulldozers wreck their damage in advance of the community engagement starting in January so the clearance of the site is a fait accompli. How cynical can you get! Note to Sanctuary - if you are bothering to read this - if you want to win over the community, and build trust, have a good re-think about bulldozing as much as you can over the Christmas break when you think no one is looking. Otherwise all you going to do is confirm perceptions, really piss the Southside community off and trash any good will just at the point you want the community to engage in a constructive way with you. That might not be wise and will reflect really badly on you. My suggestion - cease and desist and wait until after the community have had their say and agreement has been reached on what can be retained and re-used. And remember, it was the Southside community who, via subscription, paid for and built the hospital buildings and not the NHS who were handed them on a plate by the government in the 1950s, so the Southside community have a stake in what happens here.